Baba has Himself stated that His first 16 years will be marked mainly by leelas or “the playful jests of the Lord”, the next 16 by mahimas or the extraordinary happenings often described as miracles, and the subsequent years by upadesh or teaching. None of the three, He said, would be absent in any of the phases. 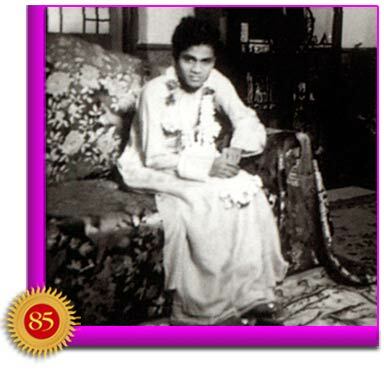 In this series, as we recount some of the highlights from His life, we have now arrived at the mahima or miracle stage with Sai Baba as a 17 year-old. 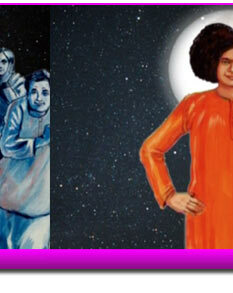 “One day, when we were all walking towards the Chitravathi, Swami suddenly disappeared. Even as we were searching for Him, we heard the sound of a clap; looking up, we saw Swami alerting us, ‘I am on top of the hill!’ It was six in the evening. The sun had softened its beams and was sinking towards the west. The sky was filled with black clouds, as if it was wrapped in a dark blanket. Swami said, ‘Look at Me. I shall show you the Sun!’ Even as we were wondering how the sun that had already set would come back again, we saw new rays rising behind Swami’s head. The whole sky was now filled with blue clouds and the rays turned red until they looked fiery; they exuded so much heat that it made us all sweat profusely. These rays were as hot as those from the scorching midday sun. 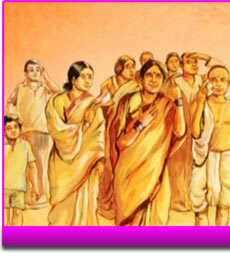 Unable to bear the heat, we loudly appealed, ‘Swami, it is too hot!’ The heat then subsided. 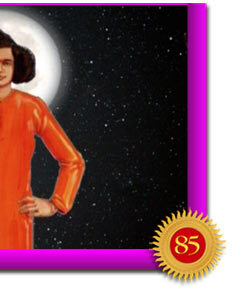 ‘Oh my God!’ We exclaimed, and were settling down, when Swami’s voice again came down to us from the top of the mountain, ‘I shall now show you the Moon.’ We saw behind Swami’s head, the half-unfolded honey-coloured rays of the moon. Soon they turned white, and became even whiter. We now began to shiver in the cold; our bodies became stiff and our teeth began to chatter. ‘Swami! It is very cold!’ And as we implored, the coolness began to slowly subside. 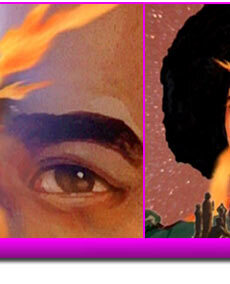 “We now began to wonder what miracle He would perform next, when He announced: I shall show you the Third Eye. Watch attentively. Third Eye?! How does it look? We wondered. 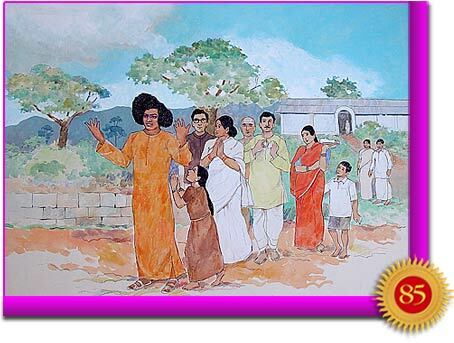 Swami’s body was not visible but His head appeared gigantic, as if stretched across the entire sky. Bewildered and stupefied, we stared at the sky. 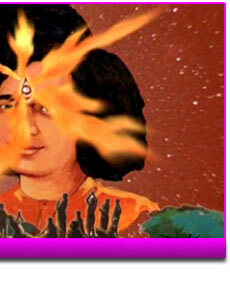 An orifice appeared on Swami’s forehead between His two eyebrows and fiery sparks issued from that opening. We were dazzled by the brilliance of those sparks. We were scared too. More than being afraid about ourselves, we were worried about what might happento Swami. The sparks continued to gush out. Meanwhile, many had fallen down unconscious, and we did not know why these people had fainted. That made us even more scared. Feeling lost and not knowing what to do, we began to cry. Suddenly, Swami was in our midst. ‘What happened?’ He asked, patting us gently on the shoulder. ‘Why are you crying? Why have all these people fainted?’ Not knowing what answers to give, we just hugged Him and continued to weep! As a few of those who had fainted recovered and got up, we mustered a little strength and asked Him, ‘Swami, are You alright? How come we did not see You there?’ Even as we asked all these questions, we patted His face to assure ourselves that He was really with us. Swami laughed heartily and assured us He was indeed alright. 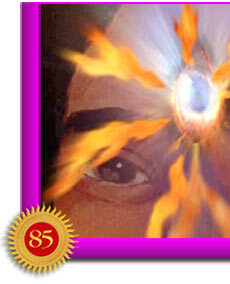 With a wave of His hand He materialised vibhuti and applied it on our foreheads. One by one, those who had swooned began to regain consciousness. It was a strange experience. We felt as if we were floating on air. It was a peculiar state of mind. We went back to the Mandir and sat down for bhajans. But could not sing properly as we all felt dizzy. We were in that state the whole evening. 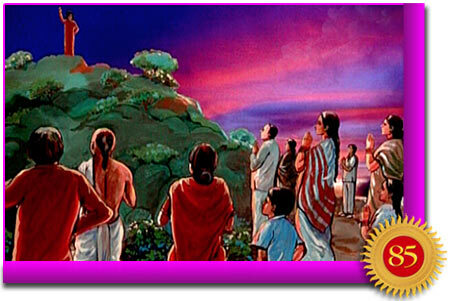 In the year 1945, it was decided a Mandir needed to be constructed. Mr. Thirumala Rao of Bangalore planned it and many hands helped in its completion. Now known as The Old Mandir, it was the scene of a curious event, the likes of which has never happened before or since. “One day after bhajan, we were all sitting around Him stringing flowers into garlands. In this work, no lady could match His skill and speed! Is there any art that He is not proficient in? The garlands that He made were thick and beautiful. Suddenly He got up and said, ‘Come on, come on! Mother Ganga is coming to visit us.’ He then went and stood near the huge main gate. He was in the centre with open arms and told us, ‘All of you stand back. None of you should go even one inch beyond these outstretched hands of Mine. Look there! Ganga is rushing forth!’ We saw the river approaching us with great ferocity, its waves fuming and frothing and rising high in the sky, and with a roaring noise. The waters came quite near us, and we children felt greatly scared; we thought, “My God! The river may swallow us!” Actually it almost touched the hem of His robe. Except the roaring water, we could not see any of the trees and shrubs that were visible until then. And now Sai extended His hands forward and touched the river. The stretch of water beneath His hand immediately became quiet and serene but the waters beyond were still frighteningly turbulent. Swami glanced at us and said, ‘Go inside and bring flowers, coconut, turmeric powder, and kumkum.’ We did as instructed and then offered all those sacred items to the River Goddess. We were quite nervous as we did so. 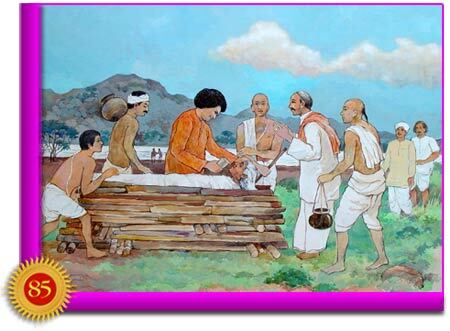 Thereafter, Swami broke the coconuts, offered them to Mother Ganga, and placing His palm on the surface of the river said, ‘We are very happy that you came to visit us. Ganga, now go back please!’ Uttering the words, He affectionately patted the waves with both His hands. As if thrilled by His gentle touch, the fury of the waters subsided and the river receded completely. We rubbed our eyes and gazed in disbelief in all four directions. Not a drop of water was to be seen anywhere! There was absolutely no trace of wetness anywhere on the ground. Swami’s robe was also dry. It was all a glorious surprise - the river going back as suddenly as it had come! We were totally baffled. 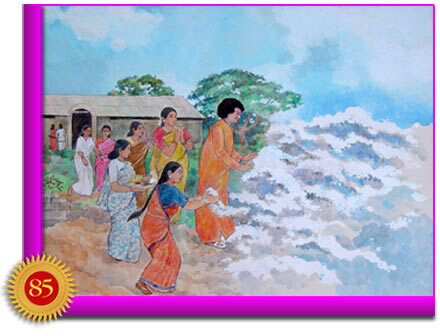 On another instance, at the seaside city of Masulipatnam or Machilipatnam, Baba walked straight into the sea. 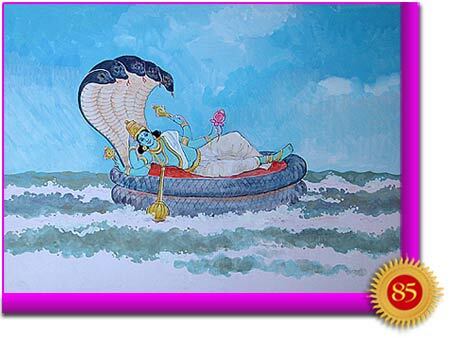 Before they knew it, devotees saw Sai Baba reclining on Vishnu’s Serpent, Sesha, atop the waves! Yet, the next moment, He was by their side. They were struck by the fact that His clothes were not even wet. Yet another day, He threw a silver cup far into the waves. The cup came back to Him filled with — not salt water — but amritha, or nectar, sweet and fragrant beyond compare! He poured a few drops into everybody’s hand. 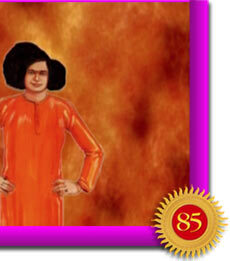 That Sai Baba had command over the five elements is evident. He, however, proved that an Avatar or a divine incarnation has power over death itself. Subbamma, who had taken utmost care of the devotees, was in failing health. She had prayed that in the last moments of life, she would be able to see Baba’s face. He was away when she took a turn for the worse. Once, the devotees from Madras (Chennai) pressurised Me to visit their place, urgently. Those were the days of the Second World War. Once in every hour, there used to be an air raid precautionary siren blowing and the streets would become empty in no time. I could not return to Puttaparthi early, in those circumstances. Meanwhile, the condition of Subbamma turned serious. She was taken to her parents’ house in Bukkapatnam where she breathed her last. In those days, firewood and other such articles to cremate a dead body were not available in the village as ‘ready-made’ items. 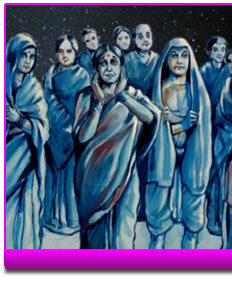 As they were Brahmins, they did not allow anybody to come near Subbamma’s dead body. 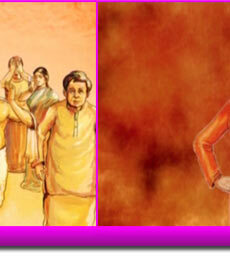 Her mother and sisters wept loudly the moment they saw Me and started showering ironical praise on Me, saying, “Baba! Subbamma had great hopes till her last moment that you would come and pour a few drops of water in her mouth. She anxiously waited for your darshan. Finally, she breathed her last, greatly disappointed. Having served you for so long, could you not have fulfilled her desire at least? Is this the reward for her loyal service?” I told them tersely, “She is not dead. Please remain quiet.” None could believe my words. Subbamma’s mother was a centenarian. I told her to bring some water dipping a few leaves of tulsi (basil plant) in it. I went near the body of Subbamma and removed the cloth covering her. And then I called her, “Subbamma! Subbamma!” She opened her eyes slowly and held My hands tightly. She shed tears of joy and gratitude. Everyone witnessing the scene was wonder-struck. According to eyewitnesses, Baba exchanged some personal words with the risen Subbamma. Finally, pouring the water prepared with basil leaves in her mouth, Baba bade her to close her eyes after which she breathed her last.